Support is an area where the stock stops dropping. It is not a specific price but an area where the stock will stop moving lower and reverse to go higher. The chart above shows the concept of support come into play. 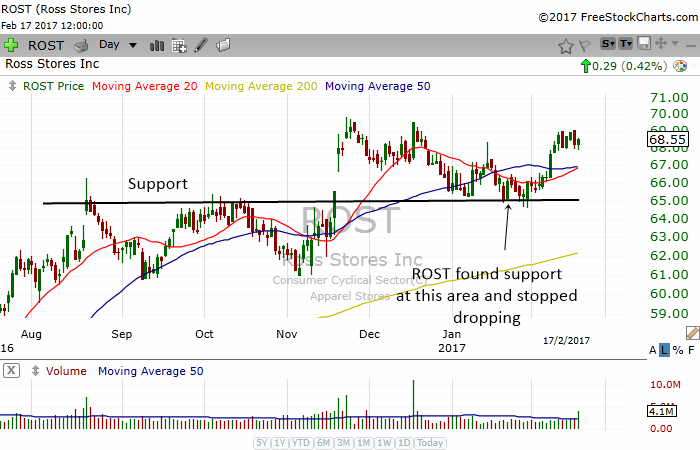 ROST had a correction in January but it found support at around $65 and then it moved higher. Congestion areas are places where there has been a lot of trading taking place. There was a lot of activity where many people bought and sold shares. There is also a lot of money being committed and therefore it acts as a very good support. 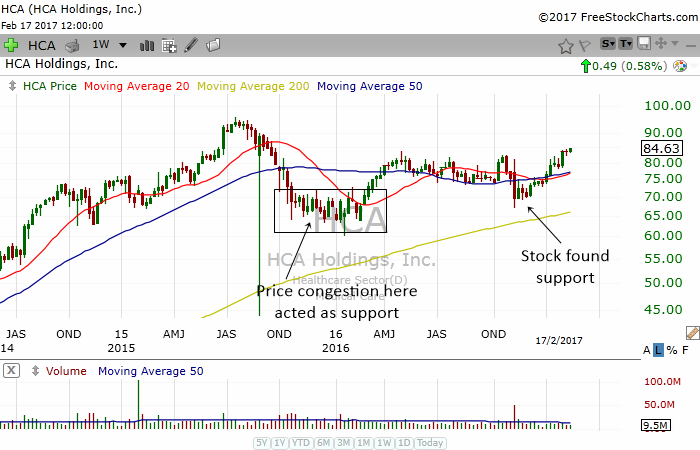 The chart above shows the weekly chart of HCA. You can see that there is a congestion area that formed during the last 3 months of 2015 to the first 3 months of 2016. Further to the right of the chart, you can see how the stock experienced a drop but it found support at the congestion area and moved higher from there. A previous high that was overcomed acts as support. The previous highs represents a previous boundary that has been broken and the stock has entered into a new frontier. When it drops back to the previous high, many stocks tend to find support and rise higher. In the chart above, ITW had a previous high in September. The stock moved above the previous high and entered a new frontier in November. ITW then had a correction in December. Notice how the stock found support at its previous high. A previous low is a last area of support for the stock. If the stock finds support at the previous low, then we can regard the stock as still being positive. If the stock falls below the previous low, then we can regard the stock as weak. 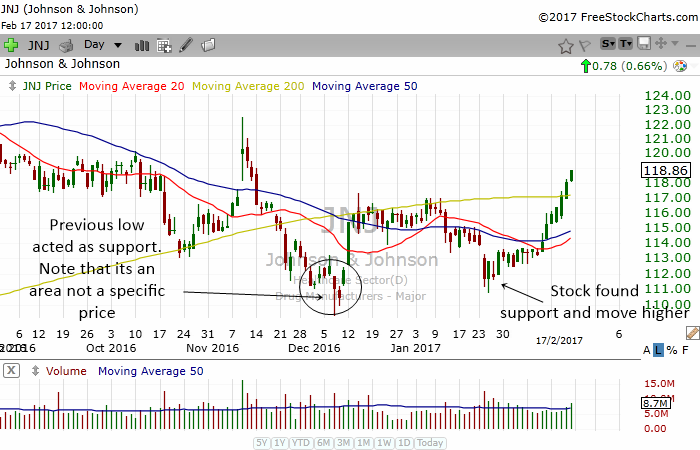 The chart above shows how JNJ found support at its previous low. Do note that support is an area and not a specific price. Many newbies think that a stock should stop dropping at exactly the same price as the previous low. Stocks often do not stop dropping at the precise price. Sometimes they reverse early or a bit late. Resistance is an area where a stock finds it hard to over come. Stocks often reverse direction and fall at resistance areas. If you can spot resistance areas you can take advantage of this knowledge and sell your stock early. You could also short the stock to profit from the downside. You might have observed that they are the same as support. That's because these ares represent battle areas. Think of support and resistance as territories that two armies are trying to conquer. Once your territory is being conquered, it immediately becomes enemy territory. Then you will be able to understand the daily battle that goes on between the bulls and the bear. You will also understand why support and resistance can be at the same area. Price congestion areas represent a massive amount of transactions that have taken place. 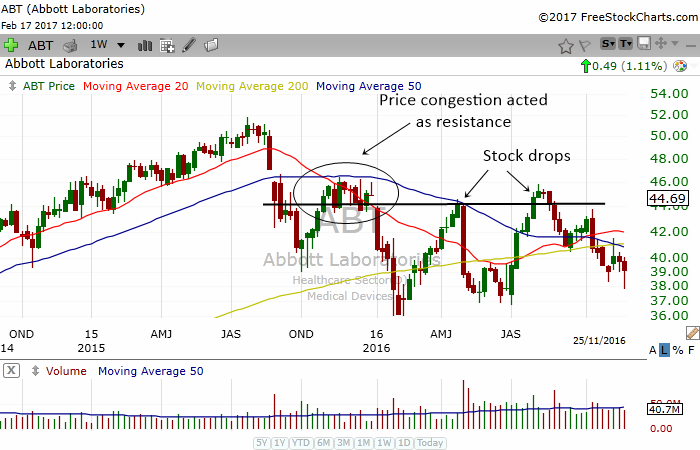 A lot of people who have bought at the congestion area will lose money when a stock drops. Therefore, when the stock rallies back to the area, there will be a lot of people selling and trying to get their money back. That's why congestion areas can be so difficult to overcome. In the chart above, ABT formed a congestion area around October to Dec 2015. No doubt there were many people who bought or sold the shares there. Notice how the stock found resistance at the area not only once but twice! Previous highs can often act like world records in an Olympic event. It is often difficult to break a previous record. Some athletes can overcome this barrier while many fail. 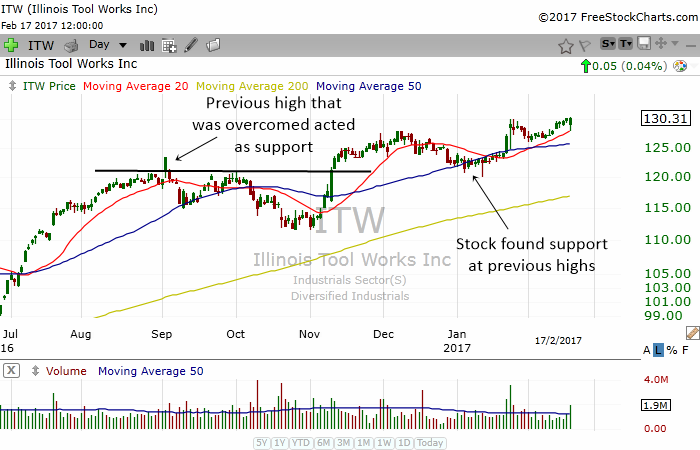 It takes a lot of momentum and strength for a stock to overcome a previous high. Therefore, stocks often find it difficult to move above a previous high. A previous high is also the place where many people have lost money. Thus, when a stock moves to the area of the previous high, many people who lost money will sell the stock to recoup their losses. This in turn pushes the price down. 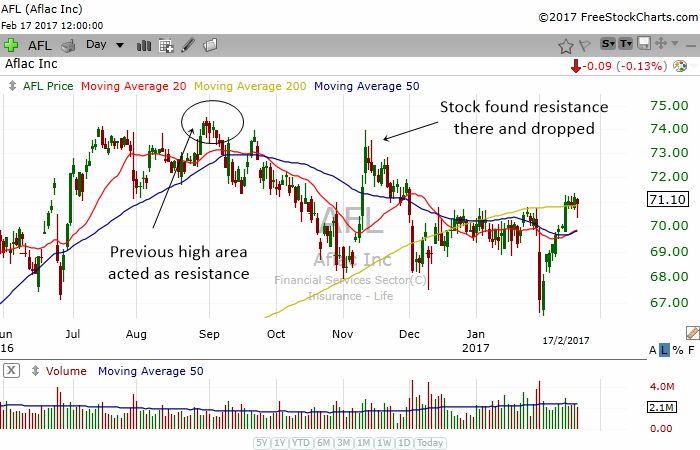 The chart above shows how AFL found resistance at the area of its previous high. Although the rise in November was a rapid one, the stock did not have enough strength and momentum to rise above the previous high. A previous low once broken can act as a resistance. That's because when a stock breaks its previous low, it enters into a new territory and the mindset of market players change. When the stock tries to rally and conquer the lost territory, it may find it hard to rise further. 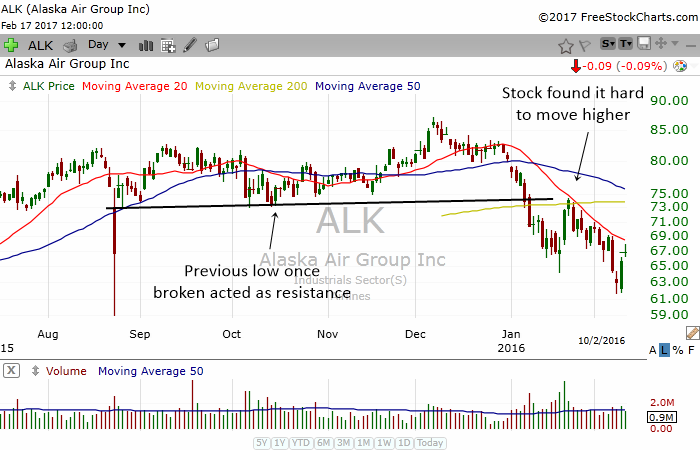 In the chart above, ALK broke below its previous low in early January 2016. It tried to rally but met with resistance and moved lower.